Higher up the Tigris, above the clay lands and with easy supplies of workable stone, a Semitic people, the Assyrians, while the Sumerians were still unconquered by the Semites, were settling about a number of cities of which Assur and Nineveh were the chief. Their peculiar physiognomy, the long nose and thick lips, was very like that of the commoner type of Polish Jew today. They wore great beards and ringletted long hair, tall caps and long robes. They were constantly engaged in mutual raiding with the Hittites to the west; they were conquered by Sargon I and became free again; a certain Tushratta, King of Mitanni, to the north-west, captured and held their capital, Nineveh, for a time; they intrigued with Egypt against Babylon and were in the pay of Egypt; they developed the military art to a very high pitch, and became mighty raiders and exacters of tribute; and at last, adopting the horse and the war chariot, they settled accounts for a time with the Hittites, and then, under Tiglath Pileser I, conquered Babylon for themselves (about 1,100 B.C.). But their hold on the lower, older, and more civilized land was not secure, and Nineveh, the stone city, as distinguished from Babylon, the brick city, remained their capital. For many centuries power swayed between Nineveh and Babylon, and sometimes it was an Assyrian and sometimes a Babylonian who claimed to be “king of the world”. For four centuries Assyria was restrained from expansion towards Egypt by a fresh northward thrust and settlement of another group of Semitic peoples, the Arameans, whose chief city was Damascus, and whose descendants are the Syrians of today. (There is, we may note, no connection whatever between the words Assyrian and Syrian. It is an accidental similarity.) Across these Syrians the Assyrian kings fought for power and expansion south-westward. In 745 B.C. arose another Tiglath Pileser, Tiglath Pileser III, the Tiglath Pileser of the Bible. He not only directed the transfer of the Israelites to Media (the “Lost Ten Tribes” whose ultimate fate has exercised so many curious minds) but he conquered and ruled Babylon, so founding what historians know as the New Assyrian Empire. His son, Shalmaneser IV, died during the siege of Samaria, and was succeeded by a usurper, who, no doubt to flatter Babylonian susceptibilities, took the ancient Akkadian Sumerian name of Sargon, Sargon II. He seems to have armed the Assyrian forces for the first time with iron weapons. It was probably Sargon II who actually carried out the deportation of the Ten Tribes. Such shiftings, about of population became a very distinctive part of the political methods of the Assyrian new empire. Whole nations who were difficult to control in their native country would be shifted en masse to unaccustomed regions and amidst strange neighbours, where their only hope of survival would lie in obedience to the supreme power. 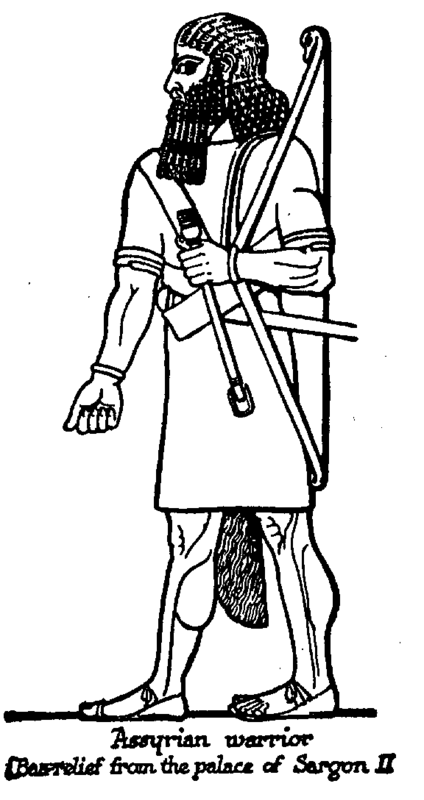 Sargon’s son, Sennacherib, led the Assyrian hosts to the borders of Egypt. There Sennacherib’s army was smitten by a pestilence, a disaster described in the nineteenth chapter of the Second Book of Kings. And it came to pass that night, that the angel of the Lord went out, and smote in the camp of the Assyrians an hundred fourscore and five thousand: and when they arose early in the morning, behold, they were all dead corpses. So Sennacherib king of Assyria departed, and went and returned, and dwelt at Nineveh. Sennacherib’s grandson, Assurbanipal (called by the Greeks Sardanapalus), did succeed in conquering and for a time holding lower Egypt. Kings xv. 20, and xvi. 7 et seq. To be murdered by his sons.